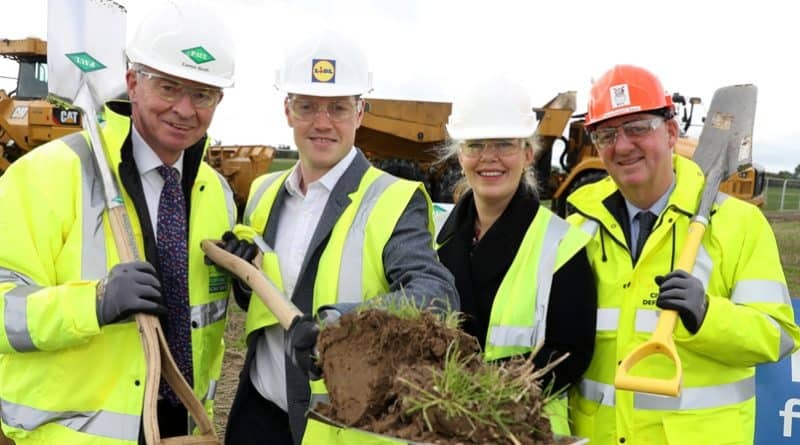 Newbridge, 25th September 2018: Work has commenced on a new €100 million distribution centre and regional headquarters for Lidl in Newbridge, Co. Kildare. The new facility, which is a key part of Lidl Ireland’s €200 million investment programme for 2018, will cost €100m and is expected to be completed by November 2019. This project represents Lidl’s largest single investment in Ireland since entering the market where the company’s total capital expenditure now exceeds €1.8 billion. Once completed, the 54,000 m² distribution centre will be equivalent in size to three Aviva stadia and will create 100 new full-time positions, adding to the 250 staff already employed in the existing Newbridge distribution centre. The new distribution centre will serve Lidl’s network of stores in the Leinster area. Lidl’s 2018 investment programme includes the opening of 10 brand new stores in Fortunestown, Nenagh, Grangegorman, Sligo, Limerick, Castleknock, Birr, Castlerea, Northwood and Dunshaughlin. The commencement of works in Newbridge was marked by a sod turning ceremony performed by Peter Carey, CEO of Kildare County Council.